“This is what the Lord says: Stand at the crossroads and look. Ask where for the ancient path, where the good way is. Walk in it, and you will find rest for your souls.” Jeremiah 6:16. There is a way of living that allows life to flourish, and there is a way of living that causes life to be diminished. In the course of our day, we make a thousand small choices, taking a course of action that will either enhance or diminish life, whether it be our own life, or the lives of those around us. Most of our behavior, however, is habitual. We simply follow the pathways that we have walked before. Scientists have now determined that each action we take deepens the neurological pathway in our brain, making it easier to take that same path again, and making it that much harder to choose a different path. ? ?How important it is, then, to stop moving now and then and really look at the paths we are on. Are we following paths that enhance life, or are we following paths that diminish life? “Where are the ancient paths, the good paths, those steps that have been proven to lead to life? How am I following those paths? Where have I wandered? What steps do I need to take to redirect my feet back on a path of flourishing? I’m doing a better these days, but I am still not where I want to be. My neurological pathways are formed, and it is hard not to pick up that phone first thing in the morning to check what happened in the world while I slept. Lately I’ve been pausing to say, “How does this path I am on make me feel? What are the things in my life that I am neglecting, now that I am engaging so much on my phone? Is this path of engagement increasing my vitality or diminishing it? 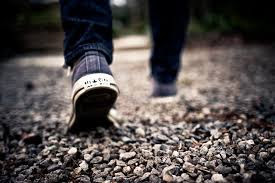 What is the ancient way that will bring satisfaction and rest to my soul?” If I stand still and look around, if I ask those kinds of questions, it becomes clear pretty quickly that it is time to change the direction of my feet and walk in a new direction. This week Craig and I were in Manitoba to speak at a pastors conference. On the way home, he had me read a paper from one of his students from Uganda. This student was talking about the role Lectio Divina had played in his life. He wrote how each night, he and is wife do lectio divina together using a passage from scripture. He spoke of the fruit of this path – how it had strengthen them and sustained them over the years. As I read it, I thought about my evening hours spent flicking through story after story the last three months, and the meager return I got for this investment. The next morning, when I woke up, I picked up my phone and began checking the news, and then stopped. I looked at the path I was about to walk down. And I thought, “This will NOT bring rest to my soul.” So Craig and I picked a passage of scripture and allowed his student to lead us down a more ancient path. We did a lectio divina together over morning coffee, and it left us feeling really satisfied inside. I am grateful for the slow pace of a snow day morning and the inward niggle inviting us to taste a different morning rhythm. “Love little ones and desire to see them grow in God? We are in need of another teacher for our Sprouts (3-6 year olds) class! Please talk to Jen Hubbard if you think this might be a good fit for you.